I hear that the price of the 122m motor yacht Alexander, a co-central agency for sale with Peter Hurzeler and Bjorn Vang-Mathisen at Ocean Independence, has had a significant €10 million price reduction. However, since her price is available strictly 'on application' only, I can't tell you what she's now asking - you'll have to contact Peter or Bjorn. Alexander started life in 1965 as a passenger vessel built by Flender Werft in in Lubeck, Germany. After several changes of ownership she was converted into a superyacht by a Greek shipping tycoon and is currently listed at number 14 in the latest Boat International chart of the world's largest 100 superyachts. 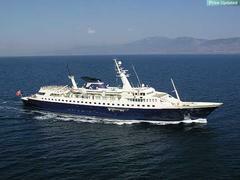 Extensively refitted in 1985 and again in 1998, she offers well-appointed accommodation for up to 60 guests. Facilities include a swimming pool, hospital, gymnasium, a 27 seat cinema and a beauty salon. She's now ready for another facelift and Ocean Independence can show you a batch of possibilities.